The dresser sat in my garage for a month... you would think I could have taken a before picture. Truth be told... I may have I just don't know where it may have ended up. 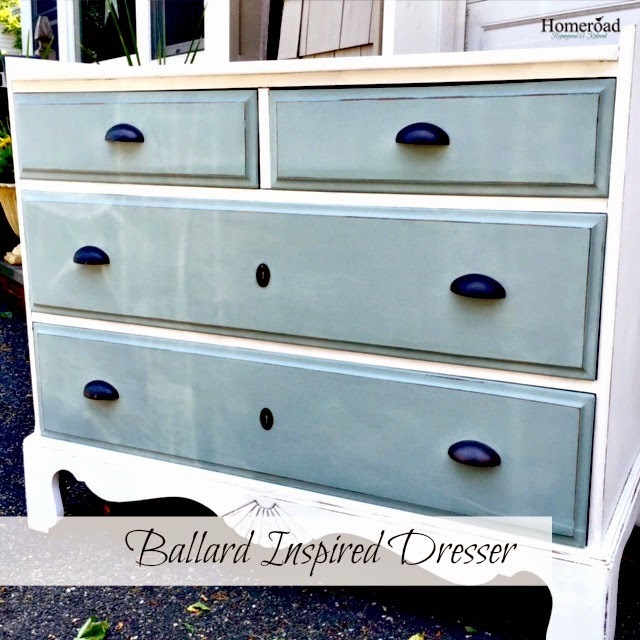 I was inspired by the Ballard catalog that comes to my house each month... a beautiful two toned dresser... white with light blue drawers and dark hardware. I started out by cleaning the piece very well using Krud Kutter... it is a product we use in the shop to clean furniture. 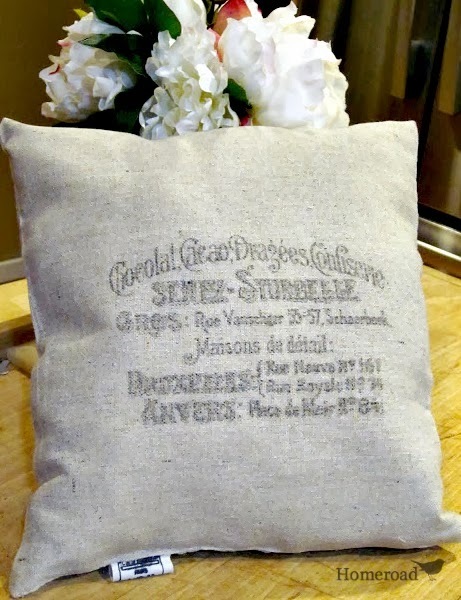 It removes grease and any stains that may be on the piece. 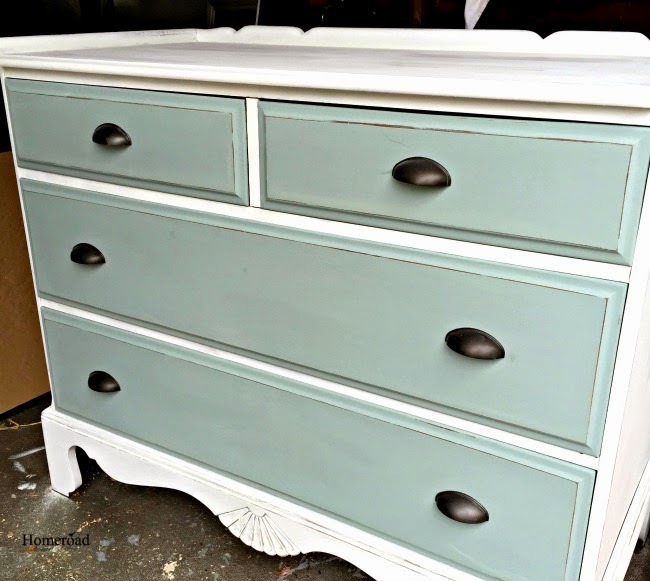 The drawers get a couple coats of Annie Sloan Chalk Paint® in Duck Egg Blue. 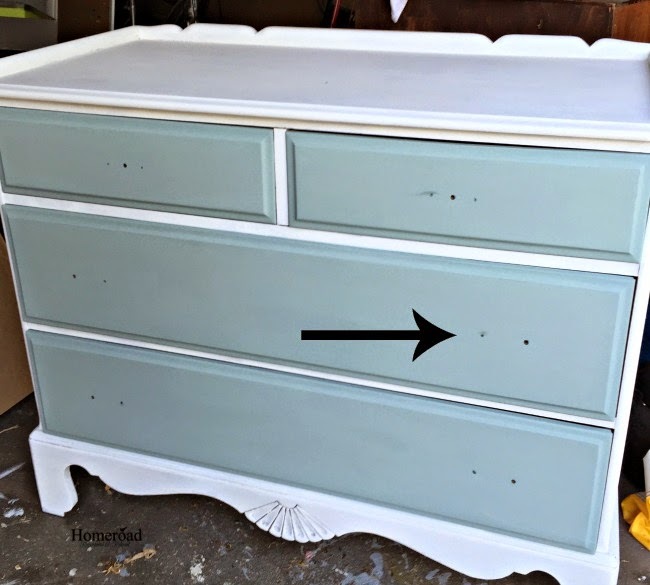 The body of the dresser is painted in Pure White. The only problem I find with painting vintage furniture with Pure White is the occasional bleed through that happens. Even after cleaning the piece well stains can appear through the white paint. I fix this problem with Zinsser Bulls Eye Spray Shellac. 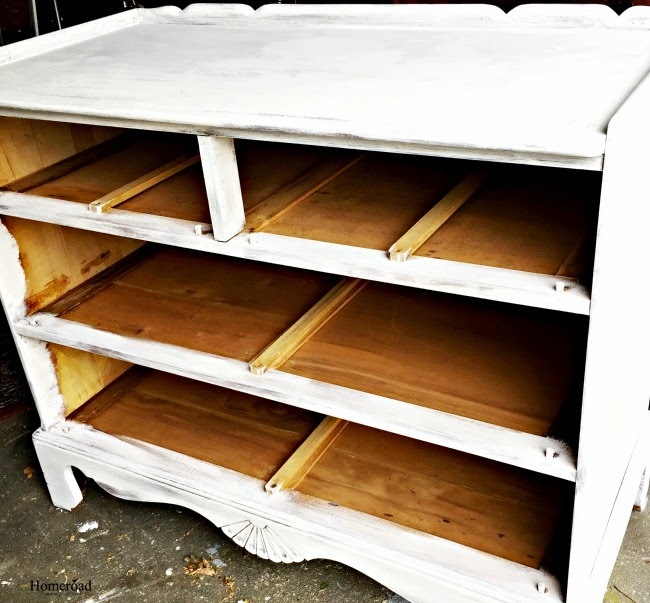 Spray the shellac over the stain, wait for it to dry, then repaint with the Chalk Paint®. Problem solved! 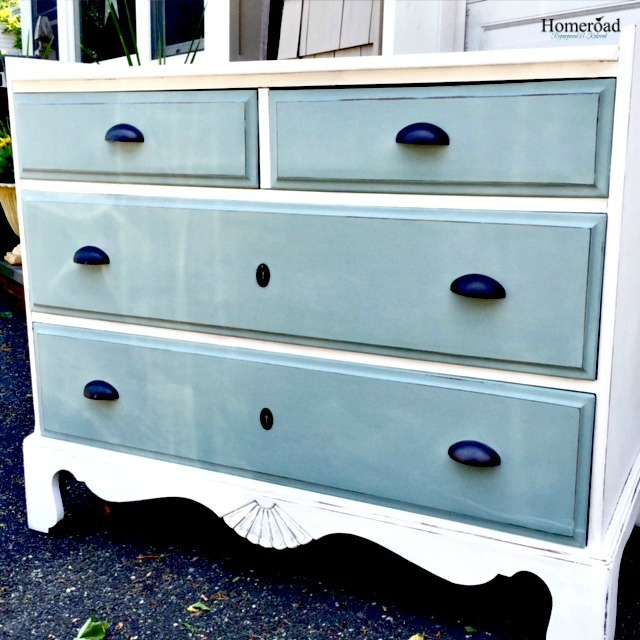 The original handles on this dresser were actually wooden knobs. I wanted to change the look so I needed to change the holes in the drawers. I made myself a template of the holes on the hardware I wanted to use. For the top drawers I put the old hole in the center and marked for the new handle holes on either side. The bottom drawers were a little easier. I used one original hole and marked the right spacing for the other hole. D. Lawless Hardware has a fantastic selection of knobs, pulls, and handles. They also have specialty items like castors, decorative key holes, and hinges. 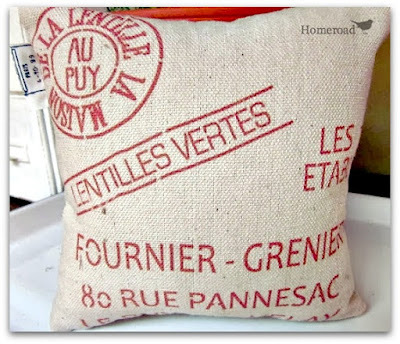 I love that your order is shipped quickly and orders over $50 ship for free! 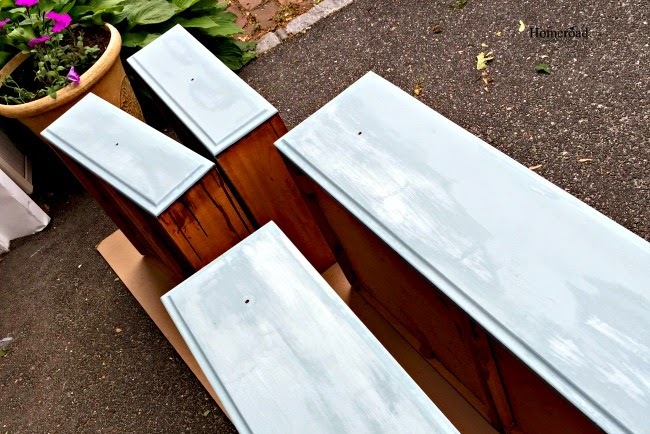 When the new handles were attached I distressed the edges of the dresser to give it an aged look... I don't like anything that looks too new and perfect. The last touch are a couple of oil rubbed bronze keyhole escutcheons. D Lawless Hardware had a great selection of these too and that final touch was all I needed to finish my Ballard inspired dresser. * Working in the driveway gave me a reflection on the dresser on my pictures which was hard to avoid. *D Lawless Hardware provided me with the hardware for this project and I couldn't be happier with the selection and the customer service. My fave colour combo! Love the handles - D Lawless ROCKS! I love it! Duck Egg is one of my favorite paint colors, and it's perfect with the white and those dark pulls. Great job Susan. I love the color and the great hardware from D. lawless hardware!